Meiko Rineck, 85, of Chippewa Falls, town of Wheaton, died Saturday, December 1, 2018 at Sacred Heart Hospital, Eau Claire. She was born Meiko Echigo in Hakodate, Hakkaido, Japan on February 24, 1933. On December 4, 1951, Meiko married Clarence Rineck in Japan. Clarence was stationed there while serving in the U.S. Army. After his tour in Japan, the couple returned to the United States for reassignment. Throughout Clarence’s military career, the couple was stationed throughout the United States and Germany. Following his retirement they moved to Clarence’s hometown of Chippewa Falls. Meiko was many things to many people. She lived her life as a giver, something her mother had instilled in her at a very early age. She gave much of herself by way of time to anyone who needed it; mentoring, teaching, caregiving or simply being a friend. She spent her life taking care of her family, including being a caregiver to her granddaughter for many years. Helping friends and family brought her much joy and satisfaction. Besides her giving nature, Meiko was a very talented artisan. She learned to sew as young girl in Japan and used that knowledge to become a skilled tailor, eventually opening her own shop, “Meiko’s Tailor Shop” in downtown Chippewa Falls. She completed alterations for many local businesses throughout the years including Boston Store and Rada’s Men’s Store. She was self-taught in many other things as well to include reupholstering and refinishing furniture. She enjoyed flower gardening, even learning how to propagate her own flowers for the next season. She loved to paint and left many pieces of art for her family to treasure. She will be dearly missed by her husband of nearly 67 years, Clarence of Chippewa Falls; three children, Pat (Wade) Wilson of Shoreview, MN, Roger (Rebecca) Rineck of Golden Valley, MN, Rick (Vicki) Rineck of Chippewa Falls; ten grandchildren, Michelle (Scott) Shaurette of Chippewa Falls, Eric (Jessica) Wilson of Eagan, MN, Rachel Rineck of Chippewa Falls, Megan Rineck of St. Anthony, MN, Michael (Courtney) Rineck of Columbus, MN, Alisa (Rachel) Wilson of St. Paul, MN, Molly Rineck of Duluth, MN, Adam Rineck of Stacy, MN, Andrew Rineck of Columbus, MN, and Rowan Rineck of Chippewa Falls; four great-grandchildren, Gwenyth, Adelyn, Brik and Audrey. 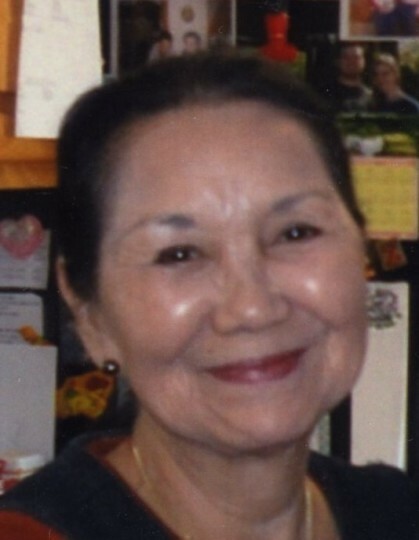 She was preceded in death by both parents and all siblings of Hokkaido, Japan and her father and mother-in-law, Fred (Anne) Rineck of Chippewa Falls. A memorial service will be held at 11 a.m., Friday, December 14th at Pederson-Volker Funeral Chapel, Chippewa Falls. Visitation will be from 4 – 7 p.m., Thursday and one hour prior to the service Friday at the funeral chapel.